•	Please use Chrome browser. •	To avoid tag mismatch copy the source to target using >, then edit the target segment. You can move text as per target syntax but be careful to copy the starting and ending tags along with the text. 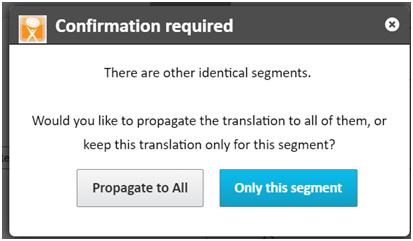 •	After completing any segment remember to click on Translated and Approved (in case of proofreading). Otherwise the translation/review Progress bar will not get updated. •	Before marking the task Complete on the Job page please make sure the Kato TM progress bar shows 100%. •	To maintain consistency within a file, select ‘Propagate to All’ when suggested. This is only for Identical Segments. •	Even after Translating/Revising all segments, if the progress bar is still not showing 100%, check if any segment has not been confirmed. If the segment is not confirmed, it will show a diagonally striped line like below. Confirm those segments by clicking on ‘Translated/Approved’. 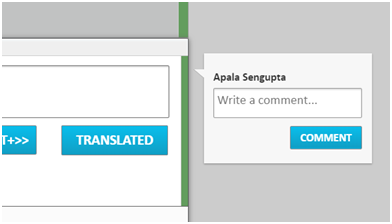 •	While translating if you need to leave any comment regarding why you used a term, or if you want to leave a comment for the reviewer, please use the comment feature. Type your comment and click on ‘COMMENT’. •	Fuzzy matches or TM-suggested translations are offered for guidance only. Don’t use them without reviewing and also editing if required. •	If you are not sure about the context or meaning of any segment, do not use literal translation. Instead raise a question on Job page or refer to the source document attached to the job page. •	Do not manually type the tags, instead use the feature (Shift+<). •	While leaving comments, please be courteous and refrain from using unprofessional, taunting, abusive or derogatory remarks. Thanks for the explanations, they were very useful. One of the main reasons I like working with MT is the glossary function. When working alone in Trados, I always add new terms to my glossary as I go along. After all, the whole point is to have all the vocabulary I need in one convenient spot. However, when working on large files on the Kató platform, I tend to use the function “add term to glossary”, to keep consistency and save time. However, many projects have hardly any glossaries, and I seem to be the only one using them. Should I not be using the glossary in this fashion? Do I need to ask permission to add terms to glossaries? To help with consistency, would it be good to encourage others to also use the glossary function? I hope this hasn’t been asked before, if so, a link to said discussion would be appreciated! Apologies for the delay in getting back to you! How are you today? Yes, adding glossary terms is certainly super important. We always encourage our volunteers to add entries, but what we always ask them is to provide references in the comment section of the tool—a link to an official publication, to the UTERM glossary, to official dictionaries, etc. For large projects, when time allows, we always try to create glossaries to work on them. Something that you can also do is keep track of all terminology you spot during the translation process, and share it in an Excel spreadsheet at the end. In column A you can include the source item, in B the target version, and in column C the reference material. The Project Officer for the project can then upload the glossary to the online translation tool. Thanks for the very detailed reply. I shall try and do that from now on.